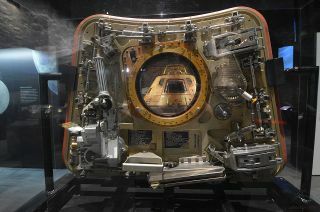 "Columbia," the Apollo 11 command module, is seen through the window of its crew hatch as displayed in the Smithsonian exhibition "Destination Moon: The Apollo 11 Mission" now at The Museum of Flight in Seattle for the flight's 50th anniversary. SEATTLE — Fifty years after splashing down in the Pacific Ocean, the spacecraft that carried the first astronauts to land on the moon has again returned to the United States' west coast. The Museum of Flight has expanded the Smithsonian's Destination Moon exhibition to highlight the roles that Washingtonians and regional companies played in making the first moon landing possible. Apollo 11 artifacts on display under a mockup of an Apollo lunar module's ascent stage in Destination Moon at The Museum of Flight in Seattle. To that end, the expanded exhibition includes a model of the lunar rover as was developed by The Boeing Company in nearby Kent, examples of the thrusters designed and built by Redmond-based Aerojet Rocketdyne and memorabilia from the 1962 World's Fair, which included the debut of the now iconic Space Needle in Seattle. The Apollo 11 command module "Columbia" as seen in Destination Moon: The Apollo 11 Mission at The Museum of Flight in Seattle. "All around the country right now, there are Apollo celebrations going on. It is going to be a big deal and you're going to feel the momentum build. And at those openings, at those exhibitions and celebrations, there are going to be people like me who can't start off their speech with 'I remember where I was on July 20, 1969,'" said Matt Hayes, president and CEO of The Museum of Flight, who was born in 1970. Click through to collectSPACE for more photos of Destination Moon: The Apollo 11 Mission at The Museum of Flight in Seattle.